Cheeseburger Macaroni pie is a pretty easy thing to make. I got to be honest I almost didnt end up making it as I could not stop eating the smoked Cheeseburger Macaroni. Smoking the ground beef gives it a flavor that you just can’t duplicate cooking it in the oven or in a pan. Cheeseburger Macaroni when put on your plate can be one big lump. Not that there is anything wrong with that. 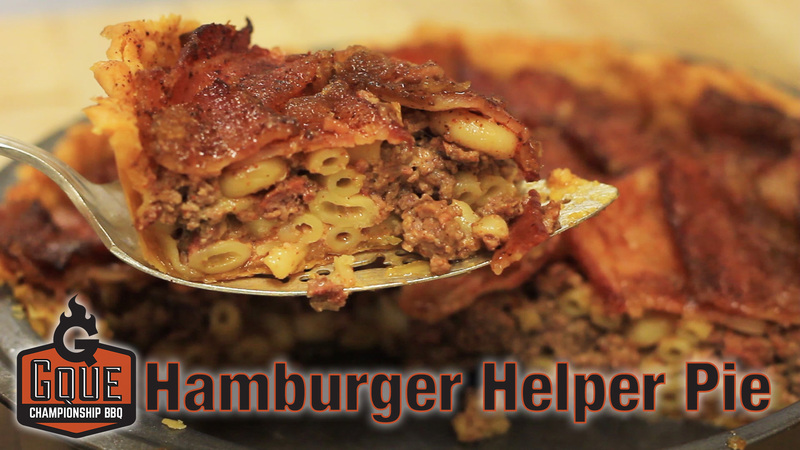 In this video we take Make Homemade Smoked Hamburger and combine with with macaroni and Cheese and bake it in a Bacon Pie crust – It is absolutely delicious! We also had our good friend T-Roy from T-Roy cooks stop by and do the test with us. Check out T-Roys channel! Thoroughly season your ground beef with the taco seasoning and mix it together well, then spread into an even layer in a pan. Smoke the ground beef at about 350 degrees till it reaches an internal temp of 165. Meanwhile, press a pie crust into a greased baking pan and use a fork to poke holes across the bottom. Once fully cooked, drain off grease from your ground beef, and stir the beef to break it up into small chunks. Add your mac and cheese to the beef and mix well until you have an even consistency. Season with The Rub, give it one final mix, and add it to your pie crust. Season both sides of your bacon and use it to make a bacon weave on top of the pie. Top with a little more of The Rub and a light coat of brown sugar, then return to the 350 degree smoker until the bacon cooks through. Let cool for about 10 minutes, then slice and enjoy! T-Roys You tube Channel has all kinds of BBQ recipes, he smokes he grills and also does Weekly BBQ talks where you can ask him questions and he answers them. He’s been around for a long time and has a good following and good depth of bbq knowledge and is happy to share what he knows.